The Center for the Study of Intercultural Dialogues (Granada, Spain) http://www.dialogoglobal.com/granada/ is now accepting applications for the 2014 two-week summer institute, Critical Muslim Studies: Decolonial Struggles, Theology of Liberation and Islamic Revival. Moreover, as a strong commitment to a vision of Critical Muslim Studies there are two symposiums organized inside the summer school every year: one on Islamic Feminism led by Asma Lamrabet (Directrice du Centre des Etudes Féminines en Islam au sein de la Rabita Mohammadia des ulémas du Maroc:http://www.annisae.ma/ ) and the other on Radical Muslim Reform led by Tariq Ramadan (Director of The Research Center for Islamic Legislation and Ethics (CILE) in Qatar: http://cilecenter.org/ ). The summer institute is open to advanced undergraduates, graduate students, post-doctoral fellows, junior faculty, activists and professionals interested in any aspect of Critical Muslim Studies. This seminar is open to both Muslims and non-Muslims. 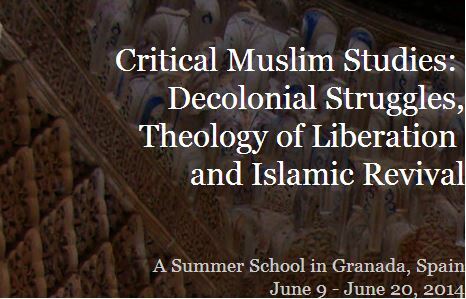 The international Summer School, Critical Muslim Studies: Decolonial Struggles, Theology of Liberation and Islamic Revival, is an intensive seminar composed of several courses (all of them held in English language) that aims at opening the space for the analysis and investigation of Islam not only as a spiritual tradition, but also as an epistemic decolonial perspective that offers contributions and responses to the problems that humanity faces today. This becomes even more relevant with the rise of the Arab revolutions, the processes towards the formation of an Islamic Theology of Liberation and the ongoing inter-religious dialogues across the world. The Summer School is held at a historic and symbolic site of Islamic Civilization and one of the major centers of Al-Andalus (Islamic Spain), the city of Granada in Spain. This course is offered through the Center of Study for Intercultural Dialogues, in Spain, in collaboration with the Ethnic Studies Program at the University of California, Berkeley. The seminar will be held in the Carmen de la Victoria at the University of Granada. The professors invited for the 2014 CRITICAL MUSLIM STUDIES Summer School cover different thematic fields, historical periods and regions of the world: Islamic Politics, Islamic Philosophy, Islamic Civilization, Islamic Feminism, Islamic Jurisprudence, Black Muslims, Middle East, North America, Europe.